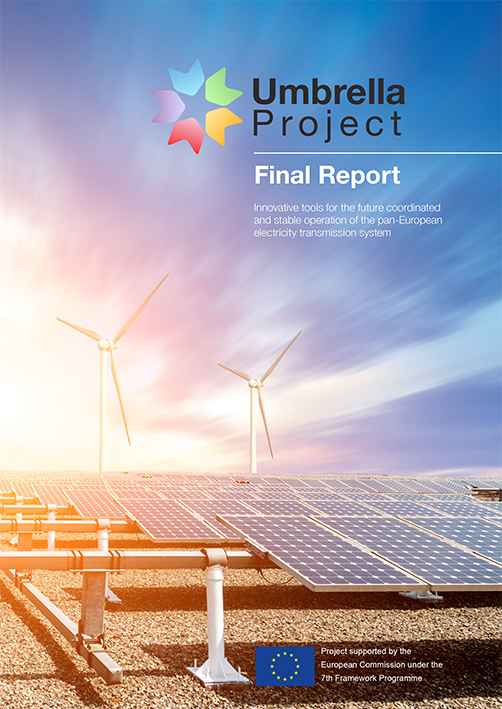 "A prototype toolbox development to ensure secure grid operation in future electricity networks"
UMBRELLA is an EC FP7 project that had the goal to provide a toolbox prototype for TSOs to ensure secure grid operation also in future electricity networks with high penetration of intermittent renewables. This toolbox enablesTSOs to act in a coordinated European target system where regional strategies converge to ensure the best possible use of the European electricity infrastructure. The UMBRELLA Project started 1 January 2012 and has ended by now. Its results have been published in deliverables which are mostly publicly available on the documents page of this website. The UMBRELLA Project's Final Report (Deliverable 1.3) has been presented at the 3rd Joint iTesla-UMBRELLA Open Workshop and is also publicly available for download here.